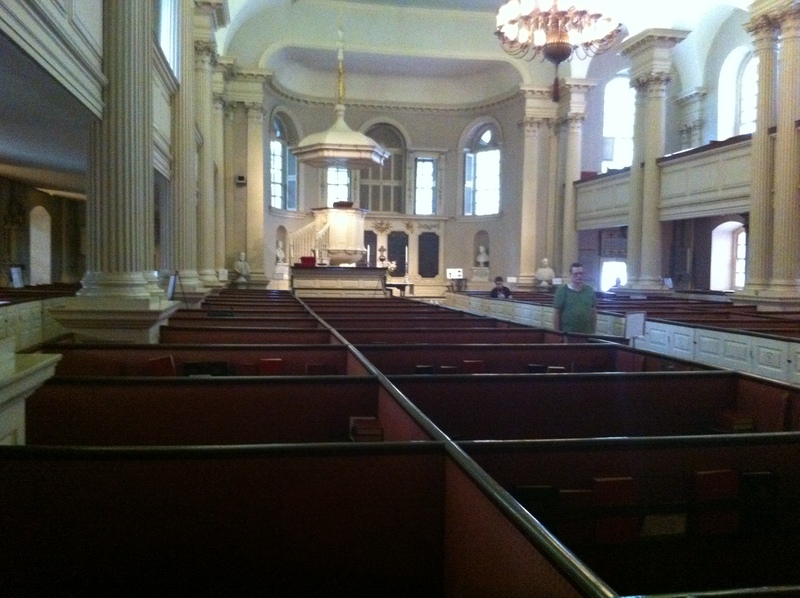 Oldest church in Boston has pew boxes that families paid for. 1. Jennifer and I are in Boston. I can now say that “I went to Harvard.” Yesterday, we walked the Freedom Trail and soaked in a little American History. I ate a lobster roll and chowda. Tonight, we are going to a Red Sox game at Fenway Park. It will be fun to check that one off the bucket list. I’m sure I will post a picture. 2. Saturday morning, we are driving to Wilmington, VT to spend time with the Valley Town Church Team. We’re looking forward to SEEING all that God is doing in and through their lives and ministries. It’s hard to believe that Valley Town just launched earlier this year on Easter Sunday. We hope to be an encouragement to them, and we will definitely talk church growth strategy. Valley Town’s big need right now is a meeting location for Sunday mornings. Ben is going to show me all of their options, and I hope to add some wisdom and experience to their decision. Let’s pray for God to lead them to the perfect place. Also, please pray for me as I will be speaking on Sunday morning. I’m praying for 5 people to commit their lives to Jesus Christ. 3. Sunday, Jim Hollandsworth will be sharing the final message in our DOMINATE series at Graystone. We will also have an update/highlight video from last Sunday’s Graystone Serves. We have received numerous thank you notes, and it’s amazing the amount of work that can be accomplished in our community with 600+ volunteers. Thanks again to everyone who served. 4. Graystone Kids is hosting a Family Fun Event tonight at 7:00 at the church. The Georgia Disc Dogs will be performing and everyone is encouraged to bring a picnic dinner. The event is FREE and will be a great time of fellowship for the entire family. 5. Next Sunday, September 16, we launch a new message series, not a fan, at Graystone Church. This will be the perfect Sunday to invite a friend. I encouraged EVERYONE a couple of weeks ago to write down 3 names on a post-it-note that you would like to invite to church. Hopefully, EVERYONE is praying for their 3 friends. Let’s do “whatever it takes” to bring people to Jesus. I still think it would be a great idea for someone to bring their friends to church in a helicopter. I’m still waiting for someone to top me in bringing our Pee Wee Softball Team to church in a hummer limo…not that it’s a competition or anything. Graystone Serves…another reason I Love My Church!